What a delight it was to host Brian, who was part of the Orvis group, for two days. 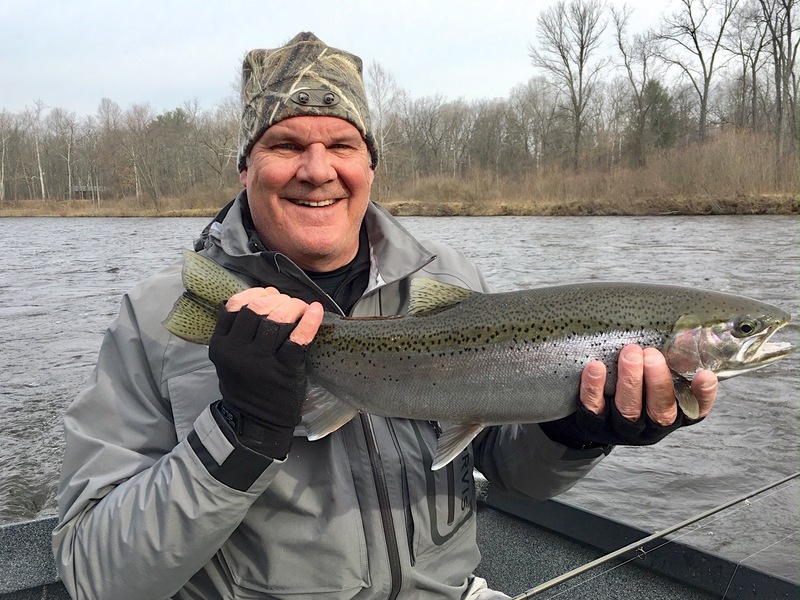 New to fly fishing for steelhead, Brian was into a number of fish, trout and steelhead, and here posts a fresh run hen that he brought to hand. Judging from Brian’s comments and his excellent casting, he’s now in danger of becoming addicted to our sport! Thanks Brian for a wonderful two days of fishing, conversation, laughs, and excitement! As for the status of the spring run, it’s just now getting underway, late to be sure, likely due to the inordinately cold river flows that only today hit 40 degrees. Spring fish continue to show up, joining the winter fish, a few of which are getting serious about steelhead love. Brown/black stone flies came off heavily this afternoon, and yesterday, stone flies were eliciting takes. In all, just a great two days of fly fishing with a great guy.